With the school year now in full swing — and in the wake of an incredible weekend of strategizing in Immokalee, FL, during the 2018 Encuentro — the Fair Food Nation is ready to kick off the semester with a bang! Next week, from Oct. 22-28, the SFA network will be staging teach-ins, theater skits and direct actions from California to New York as part of the "Pulling Back the Curtain on Wendy's" National Week of Action. We're exposing the sexual violence and exploitation behind Wendy's square burgers and the dirty deals our universities strike up with corporations that put profits over human rights. But guess what, Wendy's? Your act is up! Check out the National Week of Action's landing page for more details on how to plug in – and don't forget to peep our online action toolkit, which has helpful templates, workshop guides, sample flyers, and outreach tips. If you don't see your action listed or want to start planning for next week, hit us up at organize@sfalliance.org or call us at 239-692-1482. Students and community members crashed Wendy's college tailgating tour during the Michigan vs. Wisconsin match! The action was successful in educating hundreds of football fans about the gross human rights track record of the NCAA's latest fast-food sponsor — and even landing a Boycott Wendy's cameo on live TV during ESPN's Game Day coverage. 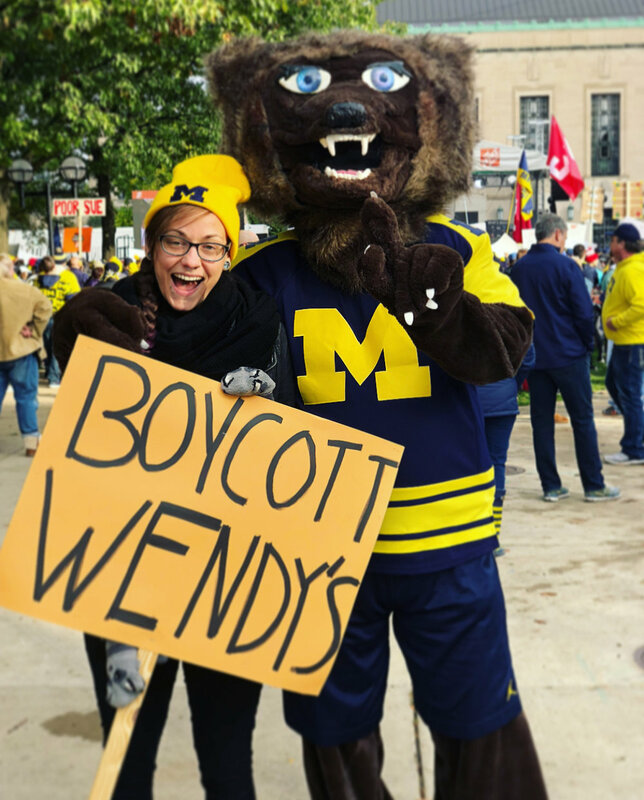 SFAers were on a roll recruiting new members for the student-led effort to prevent Wendy's from returning to campus until it joins the Fair Food Program, including none other than UMich's very own Biff, the Wolverine!